If you ask most people today what is the definition of sin, you will receive a variety of answers including no answer at all. Unfortunately, most people today are Biblically illiterate so if they do have an answer, it is usually based on what they determine as right and wrong. This is very clearly seen in many professed Christians who see no problem with engaging in practices that God warns us to avoid. 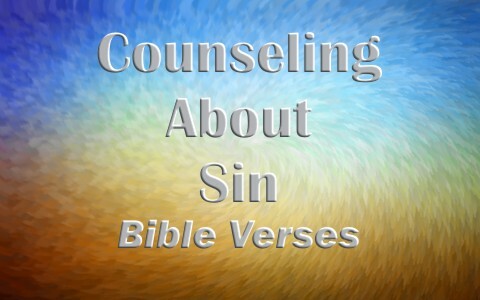 Therefore, it is important to have knowledge of good Bible verses and passages for counseling about sin. Why is understanding sin important? Several years ago, I had the opportunity to have a group of elementary school students come to our Christian school one day each week with parental approval for about an hour to participate in what was called Religious Release Time. We would play games, our senor students would act out a Bible story and lead the children in songs, and I would present a short Bible message about loving God and each other. The children were in 4th through 6th grade so they understood about right and wrong. One day, I asked the children if they could tell me what the word sin means. None of the 30 children in the group raised their hand. I repeated the question and spelled the word sin, but no one raised their hand. Immediately my heart sank. I realized that these children had no idea what sin was. Likewise, if they did not know what sin was, they had no idea that they needed a Savior. Finally, one girl raised her hand. She asked if sin has something to do with the 10 Commandments? I confirmed that it did and proceeded to explain the meaning of sin. Thankfully, they really understood what I told them. Not long after, I was able to share the gospel with them and several children trusted Christ as their Savior. This demonstrated in real life that without an understanding of sin, understanding of a need for a Savior is not possible. What are some important things to know and understand about sin? Romans 4:15. Because the law worketh wrath: for where no law is, there is no transgression. Romans 14:22-23. Hast thou faith? have it to thyself before God. Happy is he that condemneth not himself in that thing which he alloweth. And he that doubteth is damned if he eat, because he eateth not of faith: for whatsoever is not of faith is sin. Romans 4:3. For what saith the scripture? Abraham believed God, and it was counted unto him for righteousness. Romans 3:19-20. Now we know that what things soever the law saith, it saith to them who are under the law: that every mouth may be stopped, and all the world may become guilty before God. Therefore, by the deeds of the law there shall no flesh be justified in his sight: for by the law is the knowledge of sin. Romans 7:7-12. What shall we say then? Is the law sin? God forbid. Nay, I had not known sin, but by the law: for I had not known lust, except the law had said, Thou shalt not covet. But sin, taking occasion by the commandment, wrought in me all manner of concupiscence. For without the law sin was dead. For I was alive without the law once: but when the commandment came, sin revived, and I died. And the commandment, which was ordained to life, I found to be unto death. For sin, taking occasion by the commandment, deceived me, and by it slew me. Wherefore the law is holy, and the commandment holy, and just, and good. Galatians 3:23-25. But before faith came, we were kept under the law, shut up unto the faith which should afterwards be revealed. Wherefore the law was our schoolmaster to bring us unto Christ, that we might be justified by faith. But after that faith is come, we are no longer under a schoolmaster. Romans 5:18-19. Therefore as by the offence of one judgment came upon all men to condemnation; even so by the righteousness of one the free gift came upon all men unto justification of life. For as by one man’s disobedience many were made sinners, so by the obedience of one shall many be made righteous. 1 John 1:8. If we say that we have no sin, we deceive ourselves, and the truth is not in us. Ezekiel 18:20. The soul that sinneth, it shall die. The son shall not bear the iniquity of the father, neither shall the father bear the iniquity of the son: the righteousness of the righteous shall be upon him, and the wickedness of the wicked shall be upon him. Ephesians 2:8-9. For by grace are ye saved through faith; and that not of yourselves: it is the gift of God: Not of works, lest any man should boast. Romans 5:6-9. For when we were yet without strength, in due time Christ died for the ungodly. For scarcely for a righteous man will one die: yet peradventure for a good man some would even dare to die. But God commendeth his love toward us, in that, while we were yet sinners, Christ died for us. Much more then, being now justified by his blood, we shall be saved from wrath through him. 2 Corinthians 5:19-21. To wit, that God was in Christ, reconciling the world unto himself, not imputing their trespasses unto them; and hath committed unto us the word of reconciliation. Now then we are ambassadors for Christ, as though God did beseech you by us: we pray you in Christ’s stead, be ye reconciled to God. For he hath made him to be sin for us, who knew no sin; that we might be made the righteousness of God in him. 1 Peter 1:13-16. Wherefore gird up the loins of your mind, be sober, and hope to the end for the grace that is to be brought unto you at the revelation of Jesus Christ; As obedient children, not fashioning yourselves according to the former lusts in your ignorance: But as he which hath called you is holy, so be ye holy in all manner of conversation; Because it is written, Be ye holy; for I am holy. 1 John 4:19. We love him, because he first loved us. Most people today are Biblically illiterate so they do not know what God says about sin and they usually based their idea of sin on what they determine as right and wrong. Sin is the violation of God’s Law. Participating in sin demonstrates a lack of faith. Knowledge of God’s Law teaches us about sin and our guilt as sinners. All humans sin because we inherit the tendency and desire to sin. Our penalty for sin is death. Nothing we can do on our own is good enough to merit God’s forgiveness for our sins. Christ allowed Himself to be wrongfully crucified to pay our wages of sin so that we may have eternal life by trusting Him as our Savior. God wants us to live a holy life because we love Him and to demonstrate His holiness. Related reading that might be of interest to you: What is the ‘Sinful Nature’? Resources – Scripture quotations are from The Holy Bible, King James Version. (1) Strong, James. “Sin”. Strong’s number H2398 (H2403), Strong’s Talking Greek & Hebrew Dictionary. Austin, TX: WORDsearch Corp., 2007. WORDsearch CROSS e-book. (2) Strong, James. “Sin”. Strong’s number G264 (G266), Strong’s Talking Greek & Hebrew Dictionary. Austin, TX: WORDsearch Corp., 2007. WORDsearch CROSS e-book.